My mother and father grew up in the little town of Amite, Louisiana, but they never took my siblings and me to New Orleans for Mardi Gras. (Can’t imagine why) My first chance to see a Mardi Gras parade took place in Alabama. It was Mobile, Alabama to be exact. I’m embarrassed to say I thought New Orleans and Galveston, in my home state of Texas, were the only places to hold Mardi Gras celebrations. Now, I know better. Do you think there might be other stuff going on in America that I’m not aware of? Anyway, I now feel certain that many places have parades- just not as far North as Amarillo, Texas. But my first Mardi Gras experience took place where it all started. Sorry New Orleans. The first Mardi Gras parade in America was held in 1703 in Mobile, Alabama. New Orleans started their party fifteen years later. My ignorance runs even deeper. I thought Mardi Gras was maybe a week of parades and balls. Sorry, my friends, this is wrong. In Mobile the first parade of Mardi Gras is in November. 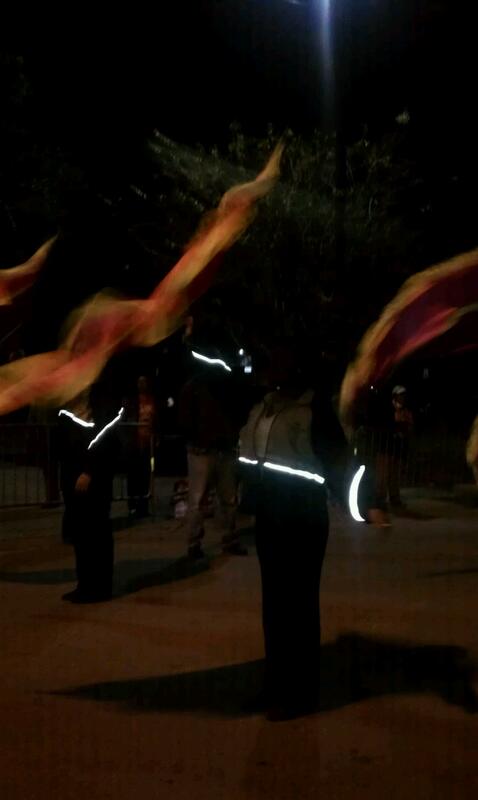 During the three weeks before Fat Tuesday, the town holds parades almost every night. And the locals do it right each night. I was there on a random Tuesday and the floats were beautiful. The high school bands that played between the floats were energetic and talented. I imagine this was not the first parade they had marched in over the last few weeks but they didn’t disappoint. Amateur float makers everywhere, we need to hang our heads in shame. We have parades in my little town and we have an awesome band but our flat-topped trailers covered in hay bales and brightly markered posters would be laughed out of the Mobile parades. 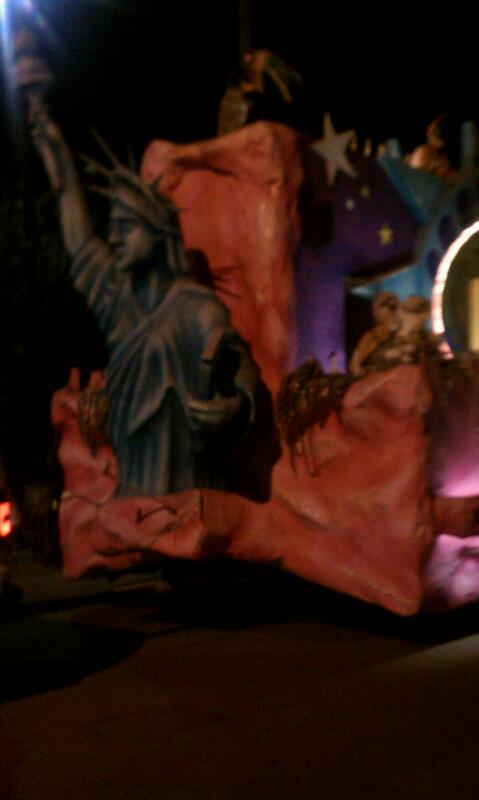 The one picture of a float that I took (below) shows you what I mean. These are well thought out designs and they don’t use the same floats night after night. I’m guessing there are hundreds of floats housed all over Mobile year round as they prepare for Mardi Gras season. Next let me tell you about the gifts tossed from the floats to the waiting crowds. 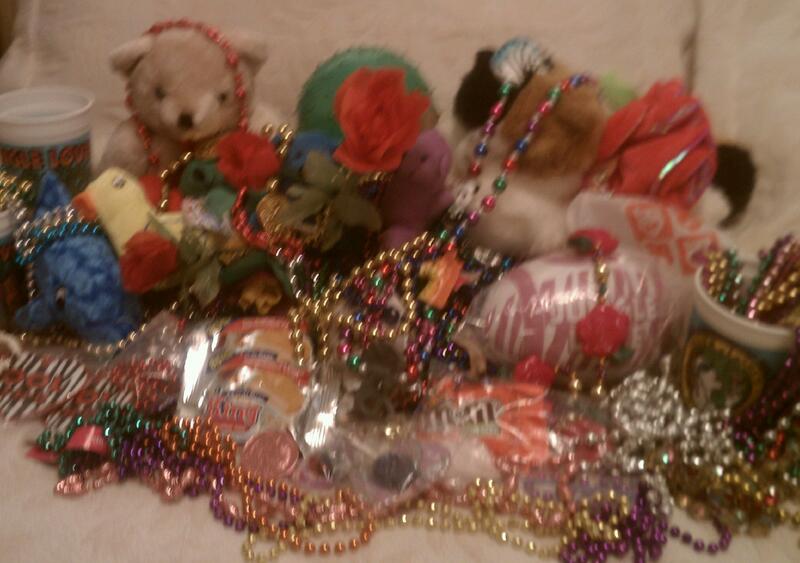 You know about the beads and doubloons but do you know about the stuffed animals, roses, candy, peanuts and Moon Pies? Yes, I said Moon Pies. In 1956, Alabama float riders started sharing Moon Pies with the crowds. I didn’t even know these treats still existed. And what do you collect your goodies in? Many parade goers have wheeled boxes. Sacks don’t work well because the torpedoed goods come quick and you need somewhere to toss your items as you prepare for your next catch. Seasoned parade goers have rakes to collect goods that don’t clear the protective three-foot fence. The plastic bags from the local grocery store that we use for our little parades would never hold the plethora of loot recovered on a Mobile Mardi Gras night. Now you understand why I didn’t get a lot of pictures. You look down and you might be sporting a bead imprint across your face the next day. And the night I went, it was ladies throwing the gifts from high atop the floats. I feel like I stumbled upon a well-kept secret. I went to a Mardi Gras parade and I didn’t have to fight Time Square sized crowds. I didn’t even have to flash anything to get beads. Cool share! It’s as close as I’ll ever get to the real thing! I hope to get back again. You never know, when I went to Alabama I had no idea I was going to a Mardi Gras parade. Well not too wild. But I do hope to go back again. So awesome! I have only been to one in Montreal and it was pretty fun! Montreal! These Mardi Gras celebrations are everywhere!! Mardi Gras in Alabama? Well, something has to happen there, I suppose! I live in a small town, and I love small town parades. I know Mobile isn’t small, but I figure it’s got a small-town vibe. I love our small town parades too. I was in New Orleans once when someone was filming a movie with a Mardi Gras scene. 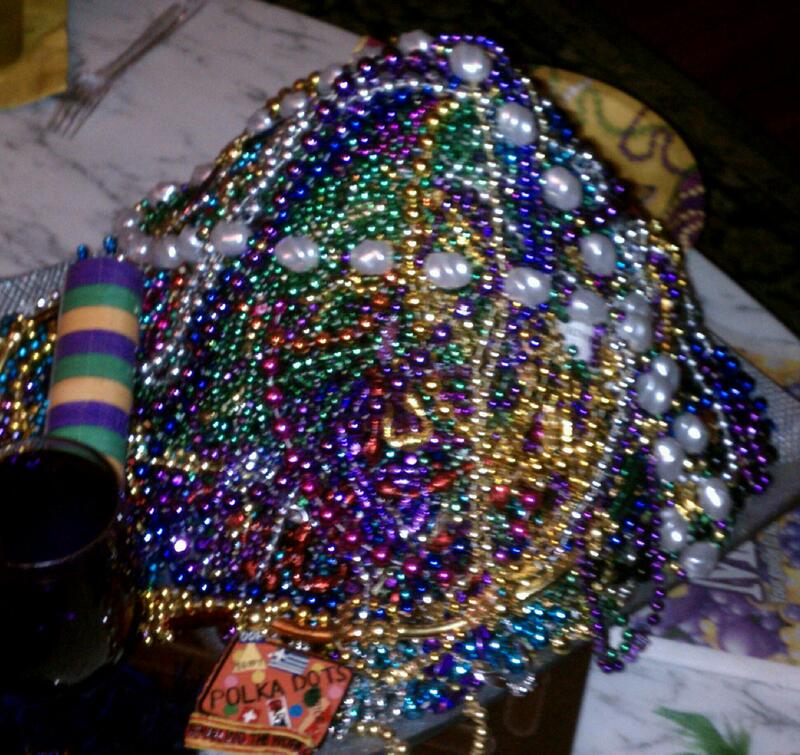 There was a float, a staged crowd, and, of course, lots of beads! Wow I had no idea that the Mardi Gras celebration started in Mobile! I don’t think I could handle it though because I’m not good with crowded places so generally parades and concerts are out but I bet it would be a really cool experience! I, too, hate crowds and luckily, the people we were with knew a great spot with a small crowd. I could see the crowds on the main street and it was more than I could have handled. It was fun. I’m with orples; I thought Mardi Gras only happened in NO and Rio! We went to the New Orleans event once, when we were 23 and had friends down there; what a blast! Now that my husband and I are a whole lot older, though, I wouldn’t dare try it again. I can’t deal with crowds so this was the ideal situation for me. Any other time of the year, I love New Orleans. I hope to go back again. I was showered with Southern hospitality. I never knew Mardi Gras was held anywhere other than New Orleans. I’m really learning a lot from these little blog sessions. Thanks for the knowledge. Thanks for sharing. Oh good. After I wrote this, I thought maybe everyone knows about Mardi Gras in Mobile. Thanks for reading.